Archangel. A musical angel hiding in the dusty, smoke-filled London clubs, she performs with reckless abandon. Few know the woman behind the mask she adorns. Mary Tudor, twin sister to Amadeus Tudor - a well known rock star- has all but given up her up and coming photography business to become the personal photographer, and fiancé to Daniel Kennedy. Daniel, a world renown violinist, is one of the few who knows Mary's secret. Together they scheme to devise a way for her to fulfill a secret dream. Postponing their wedding until after Daniel's much anticipated European tour, Mary juggles many jobs. One however alludes her every month. Motherhood. Making unannounced, surprise appearances during Daniel's tour, the mysterious Archangel rules the concert stage. Suddenly everyone wants to know who this masked woman is. Fans clamor for more, the press want to know every detail about her, and a few others are sure Daniel Kennedy is quite aware at who this phenomenon is. And if that weren't enough drama, a sinister enigma from her brother's past threatens both her future and her life. Will Archangel's identity be revealed as planned, or will the chaos of Amadeus' past catch up to them? Mary Stuart and Daniel Kennedy have not seen each other since attending a prestigious performing arts school. Now a world renowned violinist, and married to his career, Daniel stumbles across Mary through her images at a London gallery. He is in need of a photographer with vision - she is a photographer in need of clients. Mary has all but given up the stage - or has she? Her photographs pay the bills far more than her fancy musical education. But Mary has secrets. . .secrets she dare not share with even the roguish Mr. Kennedy. A roving paparazzi lens changes all that for them. . .
Can Daniel forgive Mary for hiding her past - and her present? Will their relationship break like a violin string - or will their love endure the chaos? 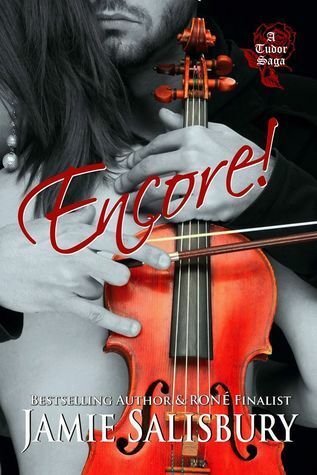 Goodreads Giveaway for an autographed copy of Encore! Giveaway ends May 17, 2015. See the giveaway details at Goodreads. Writing romance stories with passion and sass, Jamie Salisbury has seen several of her books soar to #1 on Amazon. Her novella, Tudor Rubato was a finalist in the 2012 RONE (Reward of Novel Excellence) awards. The cover won for Best Contemporary Cover. Now in 2014, her novel, Life and Lies was nominated for a RONE in the Erotica category. Her books are both self published and now include several published through Secret Cravings Publishing. Music, traveling and history are among her passions when not writing. Her previous career in public relations in and around the entertainment field has afforded her with a treasure trove of endless story ideas. You are welcome. Wishing you success.